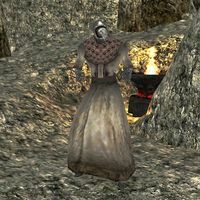 Dagoth Daynil is an Ash Ghoul in the service of the Sixth House. He can be found at Kogoruhn, in Charma's Breath. Oddly enough, he is also a merchant, though he has nothing much to sell and no gold with which to buy things. He does, however, provide repair services at base-cost, which you can take advantage of, provided you can sneak up on him or cast Calm to stop him from attacking. This page was last modified on 19 December 2013, at 22:57.